Iam ChekaZ from the Feathercoin Community. I’ve written a MiningTool for Feathercoin a few weeks ago. MinerX is an automated MiningTool for newbies. Its Java based (Yes you need Java to use it) and its combinated with SGminer. This MiningTool does only support Desktop GPUs, so no mobile GPUs are supported. The only thing you need to put in is your FeathercoinAddress and if you use an AMD card, the last two digits of your cardname (Fix is on the way). Lets say “Getting Grafik Card Series…” reads out AMD Radeon HD 7900, you need to change the last two digits in “Waiting for Series” to 7970 or 7950 or whatever 7900 card you have. Download the MinerX from below and execute the .jar. If you only download the .jar you need to put it next to your SGminer folder which should be named “Neosgminer”. NOTE: MinerX_Alpha_xx needs to be located in a local HOME folder & next to the “Neosgminer” Folder, otherwise MinerX may not be able to fetch Grafikcard information. The new MinerX Version 3.2 is running SGminer which is able to execute XIntensity. To run this without any HW-Errors you need to have AMD 14.6 RC2 Drivers installed. Not all Speccs are completely optimized! If you got any improvements, let me know! Feedback appreciated. I hope you like it. Is this a newer version or just an updated thread? I used this awhile back and it was very very easy to setup and mine with! Its a new version based on the new Nsgminer from @ghostlander, code changed a little bit. Ive also added a new pool for US in default config. Update is on the way! Sorry for the delay, did a short trip to spain (mallorca) - github gonna be updated today. Gonna compile it tomorrow and update the links. got any news or update…? New files are online, this time uploaded onto Github. EDIT: Also update on the way which makes it easier to start the Miner, without having to place the folder/.jar yourself. I just joined to the forum today. My rig i7-3770K & Zotac GTX680 4GB & Win10. I setup cuda 8.0 and downloaded MinerX 4.0 after i start minerX it shows to me HD4000 GPU and i cant change it to gtx680. What should i do or should i use different miner? Also i disable HD4000 from device manager but it didnt work. Thanks for the report of your problem, gonna look into it. No quick fix on the way, but you can just put in “NVIDIA GeForce GTX 680” into the field where the red X is, where the correct card should be displayed. That should work for you. @ChekaZ thank you so much for your quick answer and solution. Now “Start Mining” button is Orange but after i pressed its not working :S or starting something. I clicked on expert mode and edited pool address but still same. @washere Did you do it step by step? New version is on the way, to fix this issue and selffind the miner. 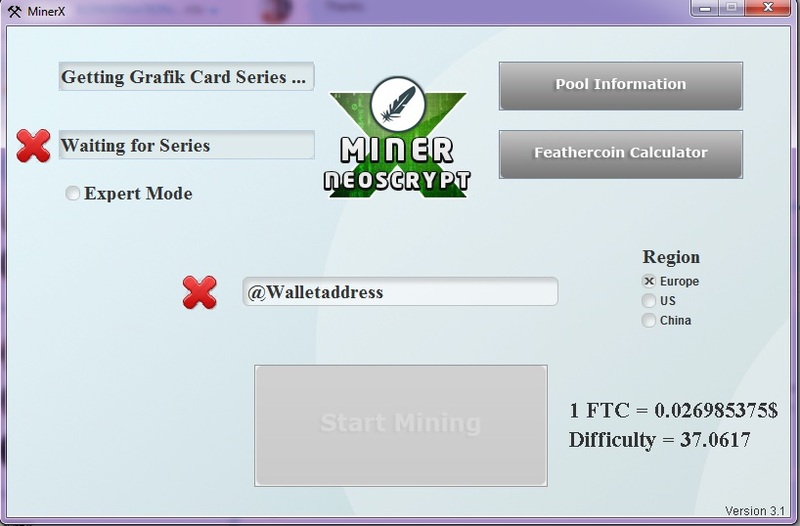 @ChekaZ i downloaded MinerX_Alpha4_0 so i have Neosgminer automaticly. If your application was an exe file i would like to say permission issue but its a jar file. @washere the .jar triggers the .exe from the miner, the MinerX is only an extension that creates a batchfile which triggers the sgminer to start mining. Its not a miner itself. -> Does the MinerX create that batchfile? @ChekaZ no it didnt create any batch file. But i get hw error because of HD4000 i think so.